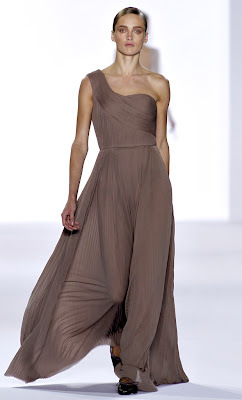 Sheer, fair, and delicate is how you would describe Chloe's S/S 2011 Collection! Crisp white, blush nudes, a touch of black and carnelian red are a few of the colours that you see coming down this runway. There is a lot of minimalism in this collection, since there are no prints and only neutral solids, but don't fall asleep yet, sometimes less is more, the more simple, may sometimes be more elegant. Overall this collection embarked on femininity, which was the total opposite for other collections during fashion week, (ie. Dsquared see last post ! ). What more could a CHLOE girl ask for? I'm at bliss!